$5,000 Performance Warranty: Sonitrol will pay for the first $5,000 of any undetected loss in addition to any insurance you may have if a forced entry is undetected and the proper authority is not notified. Satisfaction Guarantee: Sonitrol will give a full unconditional refund of your installation fee and remove our equipment from your premises if, for any reason, you are dissatisfied with your Sonitrol service up to six months after installation. Emergency Service Guarantee: Sonitrol guarantees the on-site arrival of a service technician the same day of your request, (as long as you contact us during office hours, otherwise next day service) Sonitrol will pay you $50 if we do not respond within this time frame, and, if Sonitrol is unable to repair the system, we will arrange and pay for on-site protection of your facility until the system is repaired, provided that the problem is associated with Sonitrol equipment and is not caused by misuse of the system, fire, flood, or an Act of God, beyond the control of Sonitrol. False Alarm Fine Guarantee: If you receive a false alarm citation for a false alarm that was dispatched by Sonitrol and not caused by your personnel, the telephone company, or an Act of God, Sonitrol will represent you in canceling the citation with your local Police False Alarm Coordinator. 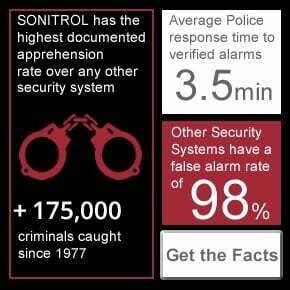 Crime Deterrent: Sonitrol has more than 175,000 criminal captures, and has the highest documented apprehension rate in the industry. 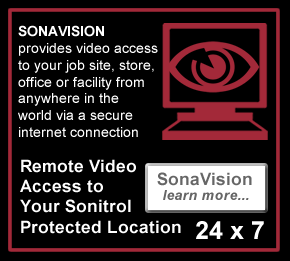 Therefore, because Sonitrol is so good at capturing criminals, thieves will avoid entering Sonitrol-monitored sites. *Some conditions might apply - Except as stated in Commitment, the terms of Customer Contract apply.